**This review is based on an early bound manuscript received from the publisher/author and an ARC received at BEA. This is an initial review, please know that there will be much more to come as the release date gets closer. That being said, this is a review from someone who has actually read the book (not just someone reviewing it based on a synopsis I read on Goodreads). I hadn’t even bothered to read about all the negativity surrounding the initial synopsis of this book before today. 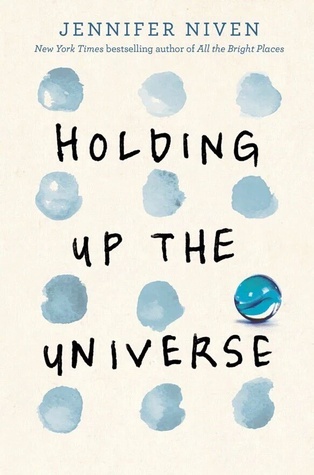 Yes, I am a Jennifer Niven fan (as you would know if you have read my blog); this means I was highly anticipating this book and let me say that I was NOT disappointed. I feel that even though I am a fan, I can be fair and (almost) unbiased in my review, but I am someone who can relate to at least one of the characters as well. I am not a small girl, I have always struggled with being overweight and have had to hear rude comments coming from those who feel bad about themselves in some way. Why would you feel the need to comment on someone else’s weight unless you are insecure? I was in no way offended by Libby’s story or by the part in the original synopsis stating that she was going to “rejoin the human race”…in her mind, that’s exactly what she was doing after being confined to her home and home-schooled for several years. She was finally ready to overcome her challenges and get back to her life! I have never felt less than human for being overweight and I don’t think Jennifer (if she even had any part in that synopsis) would ever mean for it to seem that way for anyone. Also, there are others commenting on the fact that the only way Jack could fall in love with Libby is because he couldn’t see her face…if you actually READ the book, you will understand why that is a ridiculous statement. I fell in love with these two as individual characters, as well as their love story. All the Bright Places had a huge impact on me and has been one of my favorite books EVER written. This is a less devastating story (thank goodness for no tears), but still just as important and thought-provoking. Jennifer Niven is wonderful at showing unique perspectives and writing about diverse characters. Listening to her passion while speaking about the book at a BEA panel only made me realize that more. She is not telling this story to “make fun” of anyone, but to bring awareness to peoples’ differences and make us all a little more sensitive to those around us. Her books are great for discussions as well. So, I’m done with my rant/rave here, but I will be posting more closer to the release date in October about my actual thoughts about the book (after a re-read I’m sure). If you picked up a copy of this at BEA or BookCon, READ it and SHARE it with someone who will love it! Here is a photo of the manuscript I received….it is the first one I’ve ever been sent and I adore it! I am happy to hear that it didn’t offend you. I got a signed copy at BEA and will be reading it within the next month or so. I’ve been a fat woman (I had the ability and choice to lose weight a few years ago) so I do understand fat acceptance and was teetering on the fence about it. I was hoping that this book didn’t bring up awful things. I can’t imagine Jennifer Niven would do that after writing All the Bright Places with care.